Welcome to video eleven in the Lead Guitar Quick-Start Series. In this lesson, I’m going to teach you more shapes for your major pentatonic scale. This will allow you to express yourself on other areas of the fretboard. Knowing these shapes means you’ll have a full range of tones and be able to create many different sounds when playing lead guitar. We’re going to see a few more scale shapes here, but I should clarify - rather than vaguely knowing all these shapes, it’s more important for you to know one or two of these major pentatonic shapes really well and know how to use them. This lesson is like a bonus lesson for the Lead Guitar Quick-Start Series, so feel free to take just one of these shapes, get to it well over time, and come back later to learn a new one. Let’s jump into these scale shapes. We’ll start with the G major pentatonic scale with a fourth string root, using your second finger as the starting point. 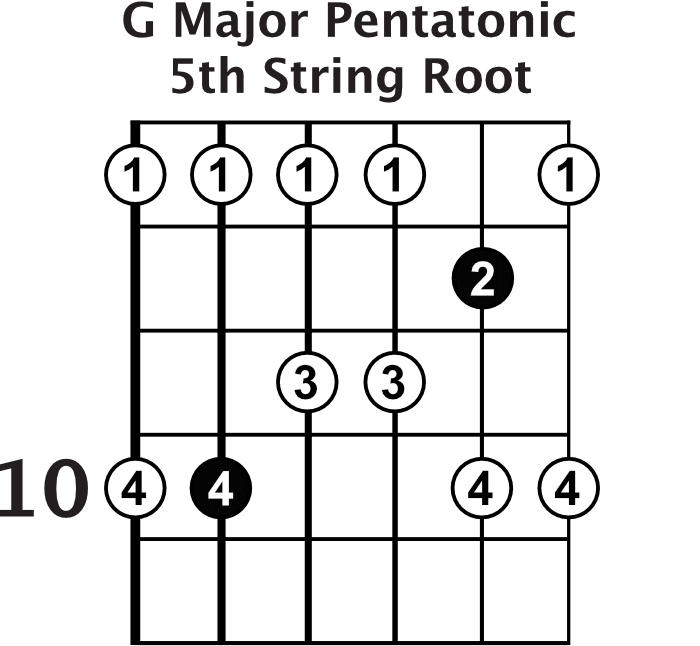 The lowest root note is the fifth fret on the D string, which is your anchor point. Play that note, and then play the seventh fret with your pinky. On the G string, hit the fourth fret with your index finger, and the seventh fret with your pinky. Your index finger with grab the fifth fret and your pinky will grab the eighth fret on the B string. For the high E string, it’s the fifth fret with your index finger and the seventh fret with your third finger. If you want to add in the lower notes to this scale shape, on the A, string play the fifth fret with your second finger, seventh fret with your pinky, and then do the same for the low E since it’s the same two note pattern. Just keep in mind your root notes are the fifth fret of the D string and the eighth fret of the B string. 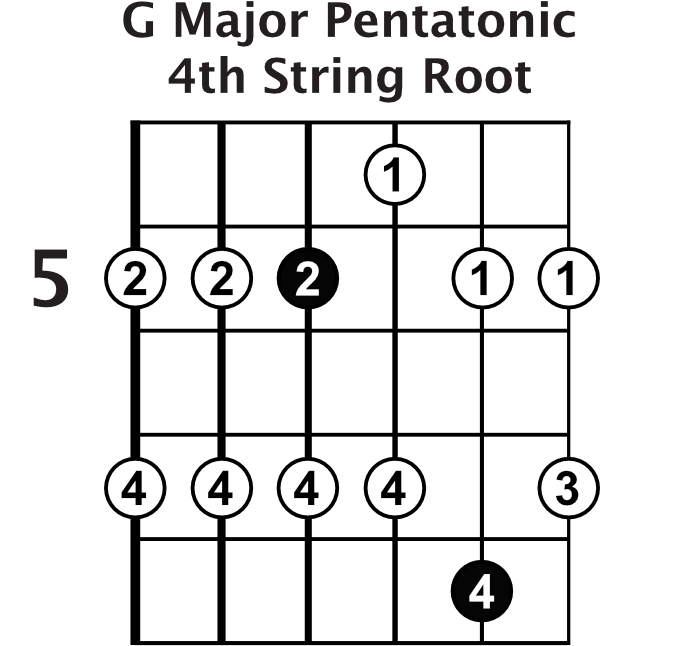 The next shape, the G major pentatonic with a fifth string root starting with your fourth finger, begins with the lowest root note on the tenth fret of the A string. From the root note, both the D and G strings have notes on the seventh fret with your first finger and ninth fret with your third finger. The B string has notes on the eighth and tenth frets with your second and fourth fingers. The high E string finishes the scale with notes on the seventh and tenth frets that you’ll play with your first and fourth fingers. If you want to play the lower notes in this shape, there is one other note on the A string which is the seventh fret with your first finger, and two notes on the E string, the seventh and tenth frets with your first and fourth fingers. The next scale up actually starts on the same root note, the tenth fret of the A string, but starts with your middle finger there instead of your pinky. That’s your lowest root note, and from there play the 12th fret with your pinky. On the D and G string, you’ve got the ninth and 12th frets to hit with your first and fourth fingers. The B and high E string also share a pattern, so you’ll play the tenth and 12th frets with your second and fourth fingers. There are only two notes here lower than the root note, which are the tenth and 12th frets with your second and fourth fingers. You’re probably feeling a little overwhelmed with these different shapes, so remember this is more like an extra credit lesson. Take these scale shapes one at a time, learn them when you can, and slowly get to know them really well. You already know the shape of the last major pentatonic scale we are going to look at, but we’re going to look at it in a different way. 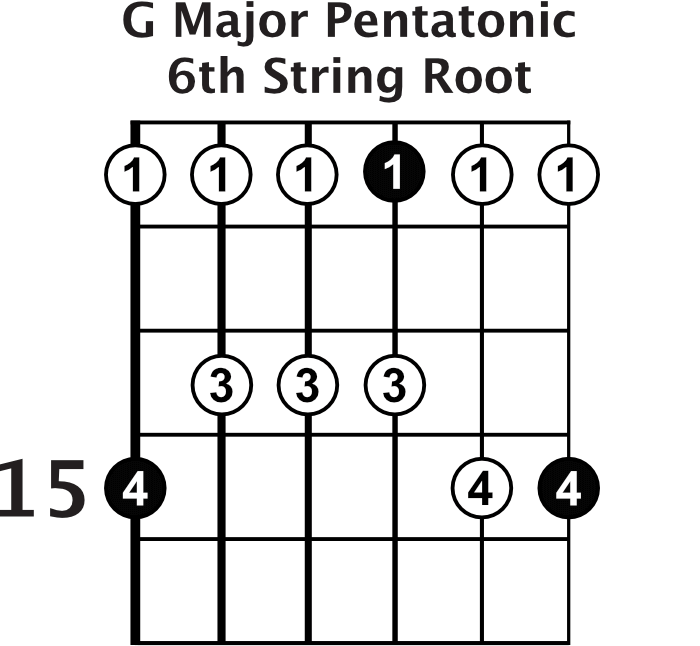 If you started this shape on an E root note on the 12th fret, it would be an E minor pentatonic scale, but if you use the G root note on the 15th fret using your pinky instead, it becomes a major pentatonic scale shape. 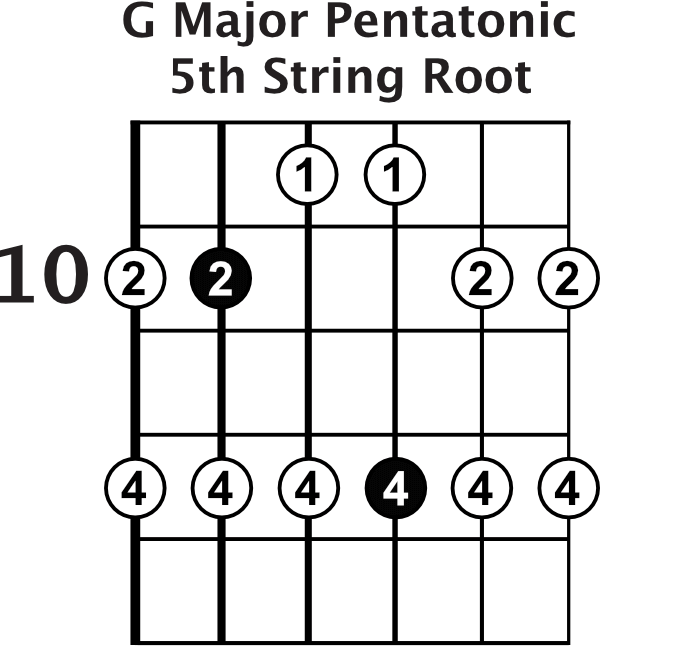 Play this scale the way you would have as a minor pentatonic shape, but starting with the G root note instead and you’ll have this G major pentatonic, sixth string root scale down. I’ll admit, this is a lot of information and it can be tough to digest all at once, but remember you only need to focus on one scale at a time. Spend time learning the scale, memorizing where all the root notes are, and practice using the scales over the jam tracks. When you are ready you can move on to the next steps for lead guitar.